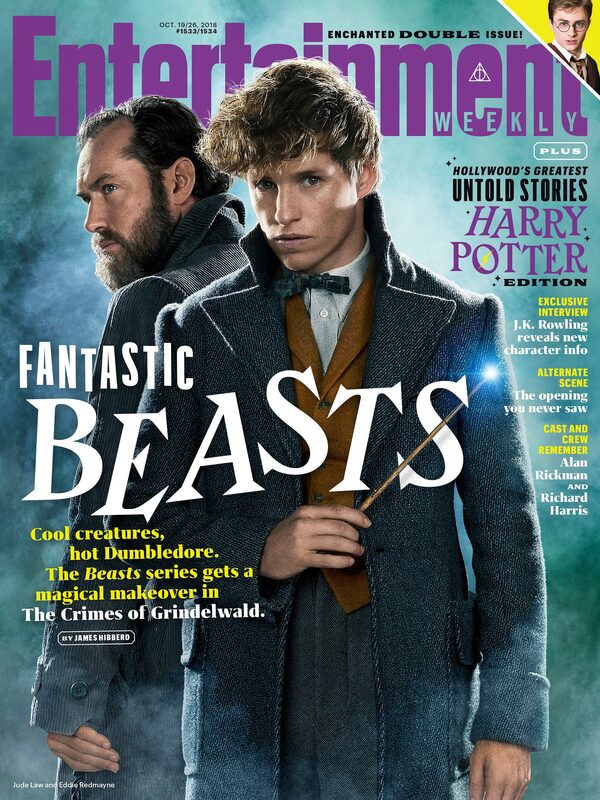 The latest issue of Entertainment Weekly serves up another load of stills from the upcoming Wizarding World sequel Fantastic Beasts: The Crimes of Grindelwald as well as a cool new cover that showcases Eddie Redmayne’s Newt Scamander and Jude Law’s Albus Dumbledore. The images arrive with captions as well, which provide some much-needed context. 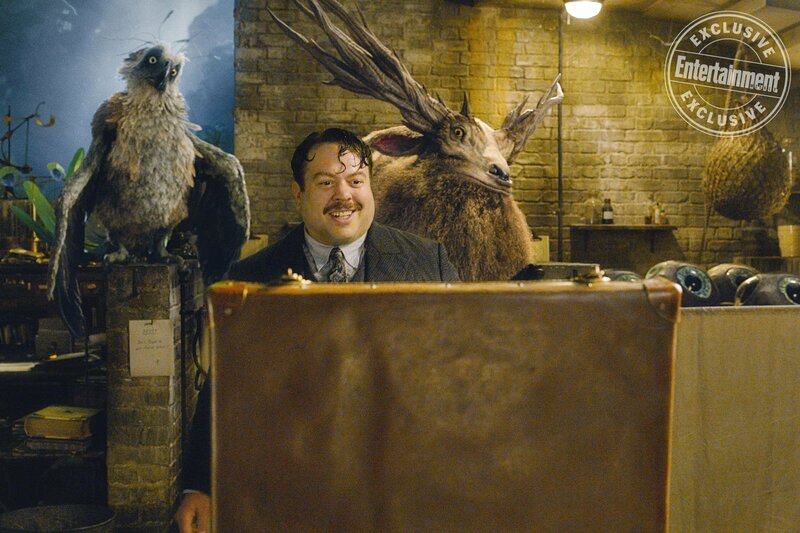 The pic of Newt with his suitcase and wand raised sees him “in the basement of his London workshop that has a refuge for injured magical creatures,” while Gellert Grindelwald’s (Johnny Depp)’s rally apparently takes place in “an amphitheater beneath the Lestrange Mausoleum.” Speaking of the Lestrange family, Leta (Zoe Kravitz) inspects her old Hogwarts desk in another image, and you can note the cutesy etchings which remind us she and Newt used to be close. 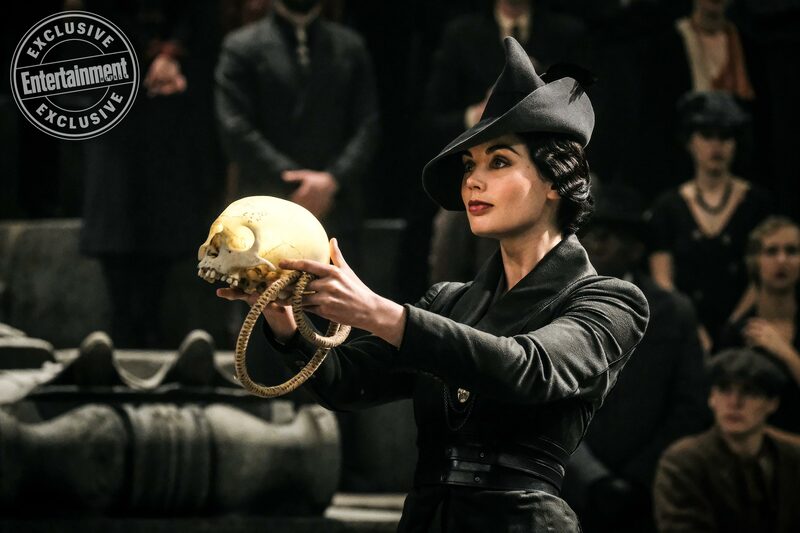 Nowadays, however, she’s engaged to Newt’s brother Theseus (Callum Turner), who’s depicted with his sibling, drawing their wands in “Pere Lachaise Cemetery.” The newcomer with the skull in her hands is “Vinda Rosier (Poppy Corby-Tuech), an ally of Grindelwald’s from a prestigious wizarding family,” and let’s not forget loveable muggle Jacob Kowalski (Dan Fogel), seen here with a “Leucrotta” on his shoulder. 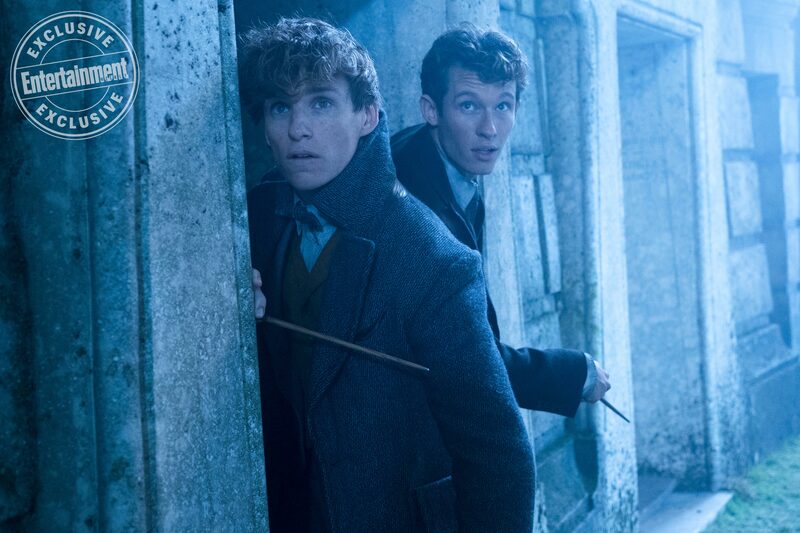 As we know, much of the plot will take place in Paris. 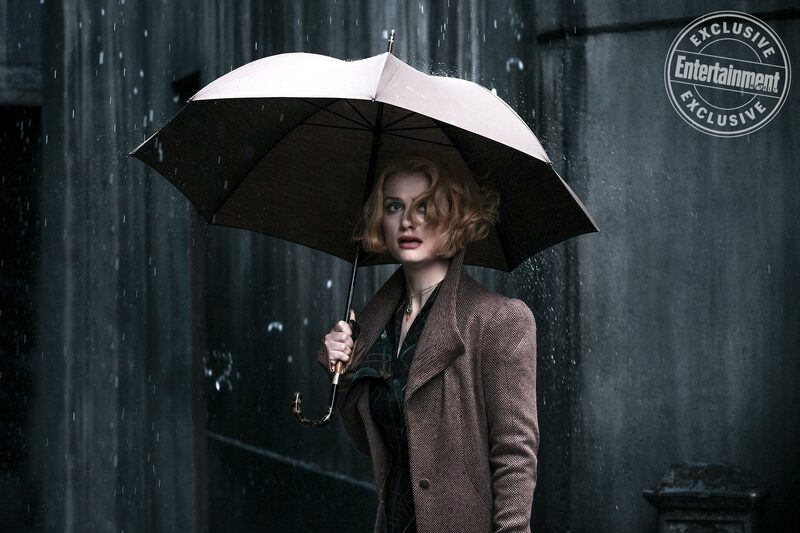 In one pic, Newt and Tina Goldstein (Katherine Waterston) are reunited when they investigate “the French Ministry of Magic Records Room.” Queenie (Alison Sudol), Tina’s sister, is also seen standing in the rain. 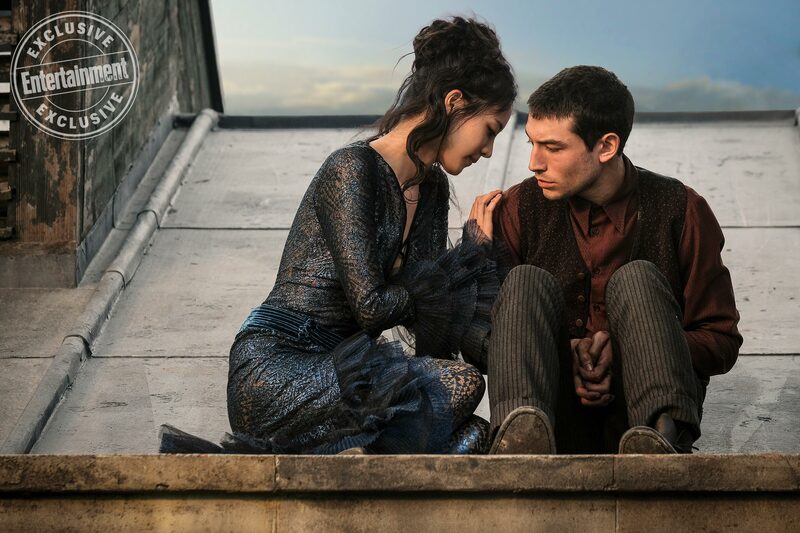 Finally, Credence Barebones (Ezra Miller) looks to be getting cozy with Nagini (Claudia Kim) on a Parisian rooftop. 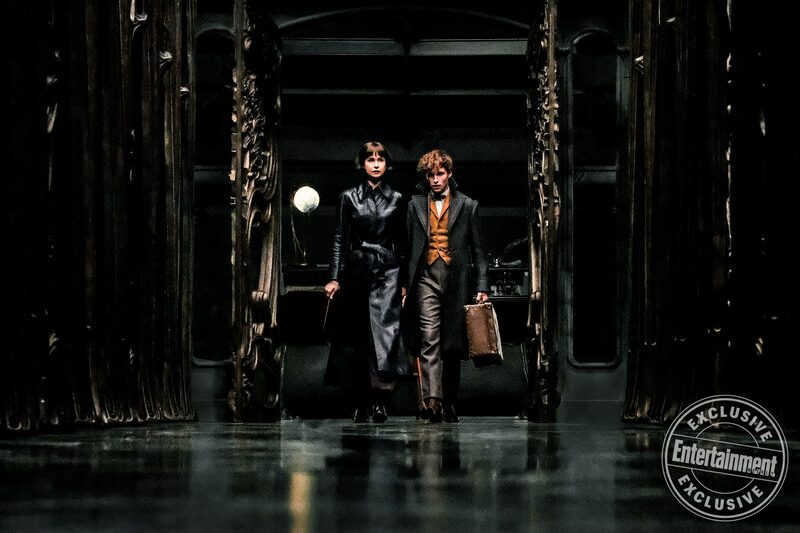 Warner Bros. is currently in the last swing of its Fantastic Beasts: The Crimes of Grindelwald marketing campaign with new posters and one final trailer arriving over the past few days. And at this point, it’s safe to say that we can hardly wait until the pic apparates into cinemas on November 16th.